Japanese course| ICC Language Schools | We provide in over 50 languages in Ginza, Shinjuku, Shibuya, Machida , Hachioji and Yokohama. For more than 25 years since its foundation in 1986, ICC has been offering high-quality Japanese language courses to individual students as well as to corporate clients. Whether you wish to improve your career options, to study or travel abroad, our excellent Japanese courses will focus on ensuring you acquire the language skills that are relevant to your goals. They will build your fluency and confidence by helping you apply the structures and functions of the Japanese language to meaningful and practical situations. ICC Japanese courses are tailor-made and adaptable. We will listen to your needs, create suitable learning solutions, and adjust and modify them where and when necessary. All Japanese courses are conducted by highly-experienced and enthusiastic native instructors, using proven teaching methods and materials. All classrooms are equipped with computers which allow instructors and students to access authentic materials via the Internet. Our Private Lessons (One-to-one lessons) system offers you total flexibility. Semi-Private lessons (Very small group lessons) are also available for students who wish to study with family members, work colleagues or friends. You can start a course at any time, and schedule your lessons how and when you like. Lessons are available from 7:00am to 10:00pm, 7 days a week, all year long. Instruction can take place in our school rooms, in your office, or in your home. All ICC schools are conveniently located, just about a 5 minute walk from major train or subway stations. Upon request, a trial lesson can be arranged at your convenience. ICC provides excellent culturally based intensive Japanese language courses for linguists from the Japanese and U.S. military, and other security and defense related agencies. We offer beginners, intermediate, advanced, and refresher Japanese courses, at all our schools. Each course is customized to suit your level,　specific needs and goals. The Japanese courses include instruction in the history, culture and current events of the nations in which Japanese is spoken. As a first-rate language services provider,our aim is to help the students improve all their Japanese language skills, especially their communicative skills, get higher scores in their chosen Japanese tests, enhance the security of their nations and succeed in their careers. Upon request, a trial lesson can be arranged at your convenience. ICC provides excellent culturally based intensive Japanese language courses for linguists from the Japanese and U.S. Police, and other security and defense related agencies. 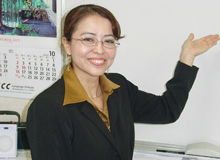 We offer beginners, intermediate, advanced, and refresher Japanese courses, at all our schools. Each course is customized to suit your level,　specific needs and goals. The Japanese courses include instruction in the history, culture and current events of the nations in which Japanese is spoken. As a first-rate language services provider,our aim is to help the students improve all their Japanese language skills, especially their communicative skills, get higher scores in their chosen Japanese tests, enhance the security of their nations and succeed in their careers. Upon request, a trial lesson can be arranged at your convenience. For more than 25 years since its foundation in 1986, ICC has been offering high-quality language programs to corporate clients, governmental and educational institutions. and to other organizations. As one of Japan’s leading providers of language services, ICC continually strives to offer the highest levels of customer service, best value and enjoyment to its cliens. Our Japanese language programs are all tailor-made and adjustable. We will listen to your needs, analyze them, create a suitable program for you, and adapt and modify it where and when necessary. The Corporate Japanese Language programs will also provide a sound understanding of business culture, etiquette and protocol. ICC is extremely privileged to have a top-notch team of instructors. Whether you would like your employees to improve their Japanese communication skills with clients, or to train them to be relocated abroad, we truly believe that ICC is your best choice. Upon request, a trial lesson can be arranged at your convenience. ICC can dispatch highly-experienced and enthusiastic native instructors to your office or home so you do not have to stress about travelling to one of our schools. Learning Japanese with members of your family, colleagues or friends with a similar level and goal can be an ideal and enjoyable way to keep you motivated. Combining expert advice and a flexible approach, ICC can design an Japanese course to suit your specific needs. Our courses will not only enable you to communicate effectively in Japanese, they will also give you the tools to address the specific cultural issues arising from working , studying or travelling in a different culture. We also offer excellent corporate language programs to corporations, educational and governmental institutions, or to any other organization. Upon request, a trial lesson can be arranged at your convenience, in one of our schools, in your office or in your home. For more than 25 years since its foundation in 1986, ICC has been providing high-quality Japanese translation and interpretation services to a wide range of corporate clients, as well as to private individuals. With more than 500 registered professional linguists, ICC can solve communication challenges in more than 50 languages and dialects, including Japanese, in a wide range of subjects and situations, quickly and accurately. Our commitment to quality and excellent service, at reasonable rates, is the reason for the very high satisfaction level of our clients. Volume discounts for translation work is available.